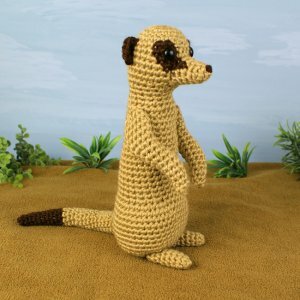 An original crochet amigurumi Meerkat pattern by June Gilbank. Meerkats live in southern Africa and are related to mongooses. They live in clans of about 20 in large underground burrows. They primarily eat insects but also munch on scorpions (they bite off the poisonous sting first). One meerkat always stands guard to look for danger such as eagles and jackals while the others forage for food. Their dark eye patches act like sunglasses to protect their eyes from the strong desert sun! Date Added: 02/28/2018 by Yvonne W.
Date Added: 08/04/2017 by Alexandra W.
Date Added: 11/23/2016 by Cindy E.
Date Added: 02/01/2016 by Jackie M.
Date Added: 10/10/2015 by Alexa B. Date Added: 06/06/2015 by Cynthia I. Date Added: 05/21/2014 by Monica B.